YABUCOA, Puerto Rico — The Army Corps of Engineers is ending its work to rebuild Puerto Rico’s electric grid, despite residents’ fears that the island’s government won’t be able to restore power on its own to more than 16,000 people who remain blacked out eight months after Hurricane Maria. The federal agency will keep operating more than 700 generators on the island, including three “mega generators” supplementing Puerto Rico’s aging and storm-damaged power plants. 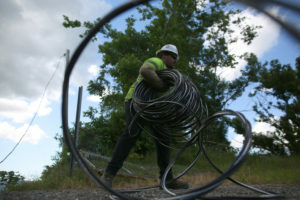 But on Friday the restoration of thousands of miles of downed power lines will be handed back to the U.S. territory’s bankrupt public utility, the Puerto Rico Electric Power Authority, or PREPA. Puerto Rican officials said 98.86 percent of PREPA’s customers had electricity Thursday, but 16,723 remained without power as the longest blackout in U.S. history continued. Trump administration officials say a big federal presence is no longer needed to hook up the relatively few remaining connections in the often-remote areas where people are still without power. But many people on and off the island are dissatisfied by the decision to pull out the Corps without Puerto Rico’s power fully restored. “It’s not in our culture to walk away from a mission when it hasn’t been fully accomplished, but we follow orders,” Charles Alexander, the Corps’ director for contingency operations, told the Senate Energy and Natural Resources Committee at a May 8 hearing. The Corps has operated under the orders of the Federal Emergency Management Agency, which says it has deferred to Gov. Ricardo Rossello’s requests on the extent and duration of federal assistance to Puerto Rico. FEMA on Thursday indefinitely extended the Corps’ power generation mission but did not extend the grid repair work because Rossello did not request that. Besides the residents of Yabucoa, hundreds of people don’t have power in the central town of Comerio, where Mayor Jose A. Santiago said many feel they have been forgotten. “They feel that there is no reason why they’ve been left for last,” he said. “What is painful is not the amount of people without electricity. It is the time that these people have been without power and we don’t see an articulate plan from the government, nobody seems to be worried with this. Associated Press photojournalist Carlos Giusti reported this story in Yabucoa and AP writer Michael Weissenstein reported from Havana.